Why did the most unruly proletariat of the Twentieth Century come to tolerate the ascendancy of a political and economic system that, by every conceivable measure, proved antagonistic to working-class interests? 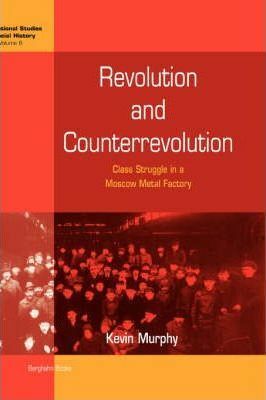 Revolution and Counterrevolution is at the center of the ongoing discussion about class identities, the Russian Revolution, and early Soviet industrial relations. Based on exhaustive research in four factory-specific archives, it is unquestionably the most thorough investigation to date on working-class life during the revolutionary era. Focusing on class conflict and workers' frequently changing response to management and state labor policies, the study also meticulously reconstructs everyday life: from leisure activities to domestic issues, the changing role of women, and popular religious belief. Its unparalleled immersion in an exceptional variety of sources at the factory level and its direct engagement with the major interpretive questions about the formation of the Stalinist system will force scholars to re-evaluate long-held assumptions about early Soviet society. Kevin Murphy teaches history at the University of Massachusetts, Boston. His current writing projects include A People's History of the Russian Revolution and a study of the role of trade unions in Soviet society.